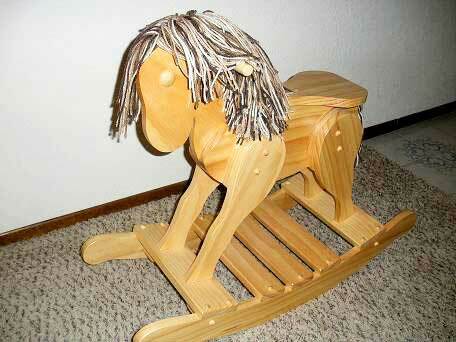 The elegant, handcrafted Thayer rocking horse is durable and made for boys and girls 3 to 6 yet strong enough for an adult. It comes assembled and ready to enjoy. The size of the Thayer is 31"long 12"wide 25"high and 18"seat height. Thayer's bio: I am a mechanic for a factory Yamaha pwc race team based in Lake Havasu AZ. I started working with wood in high school but did not realize how much I loved it until I started making things for my little girl. 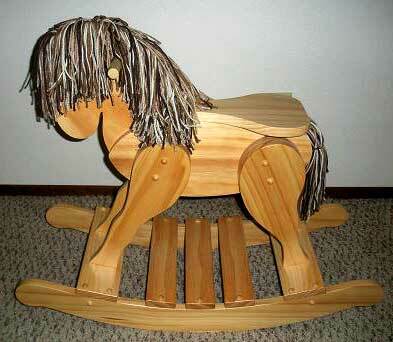 I made my first rocking horse many years ago and they have evolved from there. Wood working has become a great way for me to unwind from the challenging racing world.